This short course provides broadcast meteorologists with knowledge and instructional materials to help them understand watersheds as our environmental home and to help their viewers understand the relationship between the weather and the health and protection of the environment. Environmental impacts in many areas of the country result from the daily actions of people. We can easily see the consequences of a major oil spill at sea that is driven ashore by winds and ocean currents, but what about the fertilizer that people put on their lawns and the de-icer they apply to their driveway, or changing the car’s oil in the backyard, or the pet waste in the yard or local park? Combined with weather, all of these have an impact on both the local environment and the larger regional environment. 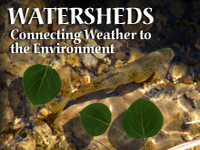 Provide an understanding of a watershed as the local environment in which people’s actions and decisions play against the background of daily and seasonal weather to affect the quality and health of their local watershed as well as the larger system of watersheds of which their watershed is one part. Not useful for international users. This is amazing because it will sharpened your mind. It can really help increase your knoledge. This module helps me get aware of how significant the watersheds to humanity. It actually blow up my mind in finding those correct answers. Some of the links to resources need to be updated. Otherwise, excelent course. This module was very informative and enjoyable to do. Me agrada muchísimo este módulo, debido a que muestra la interacción de las cuencas con el medio ambiente, incluyendo el impacto de la actividad humana sobre los diversos cuerpos de agua. Know how to describe a watershed and locate the watersheds for your viewing region. Be able to find the hydrologic address of a watershed and describe how watersheds are interconnected into a river system. Be able to relate the concept of a watershed to urban settings. Know the distribution of water within a watershed and how to find water sources for a population center in your viewing area. Describe how sources of non-point pollution, especially in urban areas, impact water quality. Know how human-engineered changes in the watershed affect the location and severity of flooding following heavy precipitation events. Be able to relate the impact of drought on a watershed and watershed system.